From the Archives: Changing the Drive Belt on a Husqvarna Cut Off Saw or Fire Rescue Saw | Desert Diamond Industries – Your Safety… Our Priority! We’ve gotten a lot of interest lately about cut off saw and fire rescue saw maintenance, so we decided to repost this article on changing a Husqvarna K970 saw’s drive belt. Tell us what you think! Knowing how to change the drive belt on your Husqvarna cut off saw or fire rescue saw can improve your cutting performance and extend your saw’s life – in other words, save you time and money. Husqvarna has put out a helpful video showing you how to do just that. The cut off saw shown here is a Husqvarna K970 saw. However, you should be able to use this procedure on any of Husqvarna’s K970 or K760 saws, like the Husqvarna K760 fire rescue saw and K970 fire rescue saw. 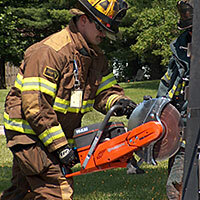 Regular readers of this blog may recognize some of these steps from our partner Brotherhood Instructors, LLC‘s video on how to convert a Husqvarna fire rescue saw to outboard cutting. That’s good news for you, because if you can do that, then you can certainly do this. This entry was posted in How To, Video and tagged Cut Off Saws, Fire Rescue Saws, How To, Husqvarna K760 Fire Rescue Gas Saw, Husqvarna K760 Gas Saw, Husqvarna K970 Fire Rescue Gas Saw, Husqvarna K970 Gas Saw, Saws, Video on April 16, 2014 by Desert Diamond Industries.